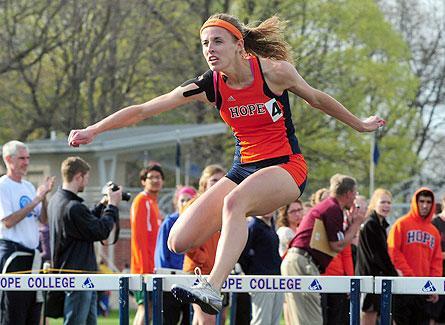 The 2013 Michigan Intercollegiate Athletic Association (MIAA) all-conference track & field teams include five Hope College athletes. Leading the group of honorees is senior Sarah Venlet of Zeeland (Holland Christian HS) who was voted the league's most valuable female track athlete. She was also named to the all-conference team for a fourth consecutive year. Venlet was the conference champion in the 100-meter and 400-meter hurdl;e events and ran the anchor leg on Hope's winning 4x100 relay. Repeating for a second year as All-MIAA honorees are junior Sheri McCormack of Holland (West Ottawa HS), senior Joel Rietsema of Rockford (Rockford HS), and junior Catherine White of Barre, Vt. (Spaulding HS). A first-time honoree is freshman Boone Marois of Traverse City (TC Central HS_. Both Hope track and field teams, coached by Kevin Cole, finished second in the MIAA standings. Two senior members of the 2012 Hope College football team are being honored by the National Football Foundation for academic excellence. Hope College veterans and players new to the collegiate experience shine on the Michigan Intercollegiate Athletic Association (MIAA) all-conference baseball and softball teams announced today by the league's coaches.